We left Oban this morning with a light drizzle falling. I was ready to spend the day riding in the rain, but it ended after half an hour or so. 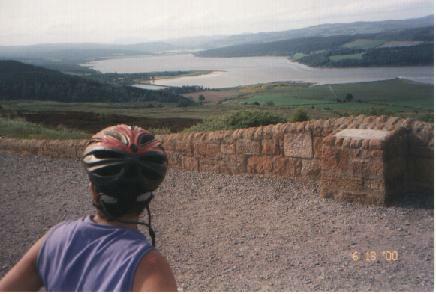 We were headed north, mostly right along the side of the lochs. We were finally getting into the highlands, and the lochs were backed by mountains rising sharply on all sides, with a layer of mists hanging half way up, and a foreboding overcast overall. By noon the skies were mostly clear when we made it into Fort William. This is a big tourist town, but it was fun spending a bit of time looking around. We took advantage of our rare early arrival to buy groceries so we could make dinner at the hostel. My cycling legs were finally back after a couple of difficult days, so a few of us finished the day off by blasting into the youth hostel in a pace line.